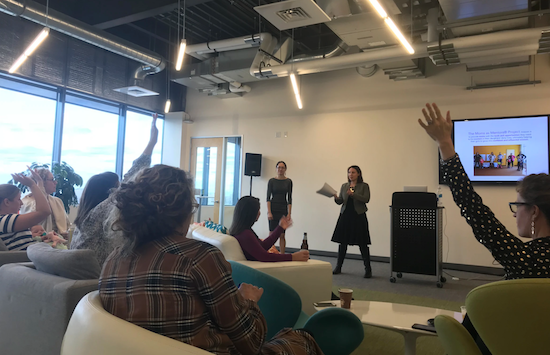 The SmartBear Women in Technology (WIT) group joined forces with a local nonprofit, Moms as Mentors®, for a workshop on being a STEM mentor. The evening focused on supporting mentors for children—particularly girls—and to encourage work and careers in STEM fields. The mission of SmartBear WIT is to create an open environment of empowerment, collaboration, support, and personal and professional growth. We believe in a world where the tech industry is driven by a diverse group of leaders. 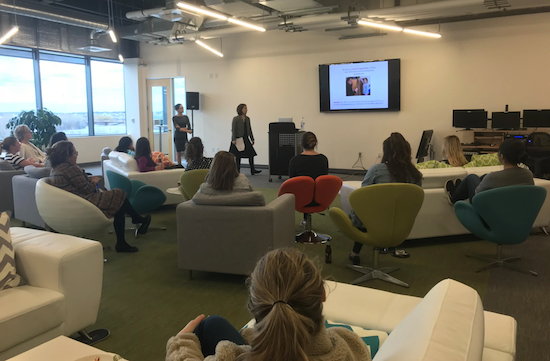 This workshop gave our team a chance to discuss how we can help ensure a future workforce of talented, confident, and driven women in STEM. My friend, Margot Sigur, mentioned Moms as Mentors® to me a few years back. Because I am in tech, and I have a young niece and nephew, and a sister who is a physics teacher, this program immediately jumped out at me. Having experienced firsthand stepping into male-dominated fields and organizations, I loved the idea of knowing I could support the important children throughout my life on their journeys in engaging in STEM programs. Margot is one of the program advisors and presented the workshop with one of the program's co-founders, Leslie Coles. SmartBear is the first tech company I've worked with that has an established WIT group. I was excited to bring Moms as Mentors® to the team for a possible event. It was amazing to see how much the STEM mentor workshop resonated with everyone. Over twenty members stayed for an evening of appetizers, learning, and discussions. A variety of women attended—from moms to aunts to women looking to be mentors for other nonprofits they work with. The session focused on how we can be mentors for the children in our lives regardless of our comfort levels or experiences with STEM, and it gave the group a chance to understand practical ways we can be STEM mentors daily. The workshop focused on empowering girls in STEM programs but gave me great insight into being a mentor for any child in my life. As mentors, we sometimes categorize ourselves by our weaknesses. For example, by saying you "just aren't a math person," this type of exclusion of our abilities is something that can affect the aspirations of kids. Our own negative or self-doubting reactions can be passed on, so working through doubts and being comfortable with our failures is important. Failure is meant to happen when we are trying new things and pushing limits to improve. We should be confident in our failures as we move to progress. One manager spoke about incorporating failures into her team meetings. This discussion helps people see how the group is experimenting to find new, better ways to do things. We celebrate what didn't work just as much as what did work, because failing is an important aspect of learning. The workshop encouraged working STEM into daily activities. Your daughter may not be interested in math specifically but relates math to something she is perhaps interested in. 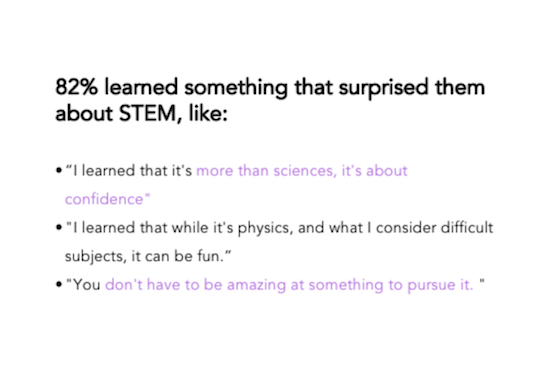 When I was in school, I didn't realize how STEM related to some of the coolest jobs out there. Now, seeing that connection, I would have been inspired to be more engaged in those subjects. Having the Moms as Mentors® team on site excites me to continue SmartBear WIT's engagement with the program. I am also bringing more focus to building the confidence of the girls in my life as a result.